Are familiar with Java including I/O, classes, objects, polymorphism, etc. 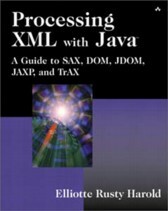 JSR-000031 XML Data Binding Specification from Bluestone, Sun, webMethods et al. The element is the tags plus the content. The file contains entity references. The document contains the entities' replacement text. Used to include large blocks of text with lots of normally illegal literal characters like < and &, typically XML or HTML. CDATA is for human authors, not for programs! Comments are for humans, not programs. Looks like a processing instruction but isn't. <!ATTLIST PHOTO xlink:type (simple) #FIXED "simple"
<!ATTLIST PUBLISHER xlink:type (simple) #FIXED "simple"
<!ATTLIST SONG xmlns CDATA       #FIXED "http://www.cafeconleche.org/namespace/song"
To distinguish between elements and attributes from different vocabularies with different meanings. To group all related elements and attributes together so that a parser can easily recognize them. URIs are purely formal. They do not necessarily point to a page. Everything after the colon is called the local part or local name. The complete name including the colon is called the qualified name or raw name. Each prefix in a qualified name is associated with a URI. For example, all elements in XSLT 1.0 style sheets are associated with the http://www.w3.org/1999/XSL/Transform URI. The customary prefix xsl is a shorthand for the longer URI http://www.w3.org/1999/XSL/Transform. You can't use the URI in the element name directly. Prefixes are bound to namespace URIs by attaching an xmlns:prefix attribute to the prefixed element or one of its ancestors. Bindings have scope within the element where they're declared. An SVG processor can recognize all three of these elements as SVG elements because they all have prefixes bound to the particular URI defined by the SVG specification. Both the DATASCHEMA and DATA elements are in the http://www.w3.org/2000/P3Pv1 namespace. Default namespaces apply only to elements, not to attributes. Thus in the above example the name, type, short, category, and size attributes are not in any namespace. Unprefixed attributes are never in any namespace. You can change the default namespace within a particular element by adding an xmlns attribute to the element. Namespaces were added to XML 1.0 after the fact, but care was taken to ensure backwards compatibility. An XML 1.0 parser that does not know about namespaces will most likely not have any troubles reading a document that uses namespaces. A namespace aware parser also checks to see that all prefixes are mapped to URIs. Otherwise it behaves almost exactly like a non-namespace aware parser. Other software that sits on top of the raw XML parser, an XSLT engine for example, may treat elements differently depending on what namespace they belong to. However, the XML parser itself mostly doesn't care as long as all well-formedness and namespace constraints are met. Many parsers have the option of whether to report namespace violations so that you can turn namespace processing on or off as you see fit. I have learned to be even more skeptical than before about the slew of APIs doing the rounds in the XML development community. An XML instance is just a documents, guys; you need to understand the document structure and document interchange choreography of your systems. Don't let some API get in the way of your understanding of XML systems at the document level. If you do, you run the risk becoming a slave to the APIs and hitting a wall when the APIs fail you. The stereotypical "Desperate Perl Hacker" (DPH) is supposed to be able to write an XML parser in a weekend. The parser does the hard work for you. Your code reads the document through the parser's API. Saxon is incompatible with Ant. Adapter classes convert between parsers. As the document is read, the parser calls back to the methods of the ContentHandler to tell it what it's seeing in the document. System.out.println("Could not locate a parser." http://www.cafeconleche.org/ is not well formed. These classes were designed to fill holes in SAX1. They are unnecessary and actively harmful when working with SAX2. attributeString += atts.getQName(i) + "=\""
System.out.println("startElement(" + namespaceURI + ", "
System.out.println("endElement(" + namespaceURI + ", "
System.out.println("characters(" + textString + ", "
System.out.println("processingInstruction(" + target + ", "
System.out.println("startPrefixMapping(\"" + prefix + "\", \""
Should we return an array, an Enumeration, a List, or what? Perhaps we should use multiple threads? The character data of each url element needs to be stored. Everything else can be ignored. A startElement() with the name url indicates that we need to start storing this data. Should we hide the XML parsing inside a non-public class to avoid accidentally calling the methods from unexpected places or threads? Features can be read-only or read/write. The parser does not allow this value for a requested feature/property, or the feature/property is read-only, or the feature/property cannot be read/written at this moment in the parsing process. If true, then perform namespace processing. If true, then report the original prefixed names and attributes used for namespace declarations. If false, then do not report attributes used for namespace declarations, and optionally do not report original prefixed names. If true, then all element names, prefixes, attribute names, namespace URIs, and local names are internalized using java.lang.String.intern(). If false, then names are not necessarily internalized. If false, then do not report validation errors. If true, then include all external general (text) entities. false: Do not include external general entities. If true, then include all external parameter entities, including the external DTD subset. false: Do not include any external parameter entities, even the external DTD subset. Not all parsers are validating but Xerces-J is. out.write(" at line " + ex.getLineNumber() + ", column "
"Installed XML parser cannot validate;"
"Cannot turn on validation here; "
description: An optional extension handler for items like comments that are not part of the information set and may be omitted. description: An optional extension handler for ATTLIST and ELEMENT declarations (but not notations and unparsed entities). description: When parsing, the current DOM node being visited if this is a DOM iterator; when not parsing, the root DOM node for iteration. description: The literal string of characters that was the source for the current event. True: The parser will validate the document if a DTD is specified in a DOCTYPE declaration or using the appropriate schema attributes like xsi:noNamespaceSchemaLocation. False: Validation is determined by the state of the http://xml.org/sax/features/validation feature. True: Warn on duplicate attribute declaration. False: Do not warn on duplicate attribute declaration. True: Warn if element referenced in content model is not declared. False: Do not warn if element referenced in content model is not declared. True: Allow Java encoding names like 8859_1 in XML and text declarations. False: Do not allow Java encoding names in XML and text declarations. True: Continue after fatal error. False: Stops parse on first fatal error. True: perform checking that may be time-consuming or memory intensive. Extension handlers are non-required interfaces in the org.xml.sax.ext package. To set the LexicalHandler for an XML reader, set the property http://xml.org/sax/handlers/LexicalHandler. To set the DeclHandler for an XML reader, set the property http://xml.org/sax/handlers/DeclHandler. If the reader does not support the requested property, it will throw a SAXNotRecognizedException or a SAXNotSupportedException. The startElement() method in ContentHandler receives as an argument an Attributes object containing all attributes on that tag. The XMLFilter interface is like an XML reader, "except that it obtains its events from another XML reader rather than a primary source like an XML document or database. Filters can modify a stream of events as they pass on to the final application." The parent is the parser the filter gets the data from. // Are there any unparsed entities in the attributes? SAX2 can be configured on top of a lot of different parsers with different capabilities. What the parser does is more important than what SAX2 does. For example the characters() method is not guaranteed to give you the maximum number of contiguous characters. It may split a single run of characters over multiple method calls. The DOM (like XML) is not a triumph of elegance; it's a triumph of "if we do not hang together, we shall hang separately." At least the Browser Wars were not followed by API Wars. Better a common API that we all love to hate than a bazillion contending APIs that carve the Web up into contending enclaves of True Believers. An XML document can be represented as a tree. DOM focuses more on the document; SAX focuses more on the parser. Only the core and traversal modules really apply to XML. The other six are for HTML. Entire document is represented as a tree. Some nodes may contain other nodes (depending on node type). // This is simpler but less flexible than the SAX approach. // Perhaps a good creational design pattern is needed here? The builder parses the document and returns a DOM org.w3c.dom.Document object. Attributes are missing from this output. They are not nodes. They are properties of nodes. We can easily find out how many URLs there will be when we finish parsing, since they're all in memory. Single threaded by nature; no benefit to multiple threads since no data will be available until the entire document has been read and parsed. The character data of each url element needs to be read. Everything else can be ignored. The getElementsByTagName() method in Document gives us a quick list of all the url elements. The XML parsing is so straight-forward it can be done inside one method. No extra class is required. <PHOTO ALT="Victor Willis in Cop Outfit" HEIGHT="200" WIDTH="100"
PUBLIC "-//W3C//DTD XHTML 1.0 Frameset//EN"
an example of a general entity reference. An invalid or illegal character is specified, such as in a name. An attempt is made to use an object that is not, or no longer, usable. An invalid or illegal string is specified. An attempt to modify the type of the underlying object. An attempt is made to create or change an object in a way which is incorrect with regard to namespaces. A parameter or an operation is not supported by the underlying object. Type Text: #text "Hot Cop"
Type Text: #text "Jacques Morali"
Type Text: #text "Henri Belolo"
Type Text: #text "Victor Willis"
an example of a general entity reference. " Type Text: #text "Village People"
Attributes are missing from this output. They are not children. They are properties of nodes. Question: Why won't this let us add an xml-stylesheet directive? <description>THE source for news on the Mozilla Organization. Validity is not automatically maintained.